Announcements From Ensembles & SOLO! 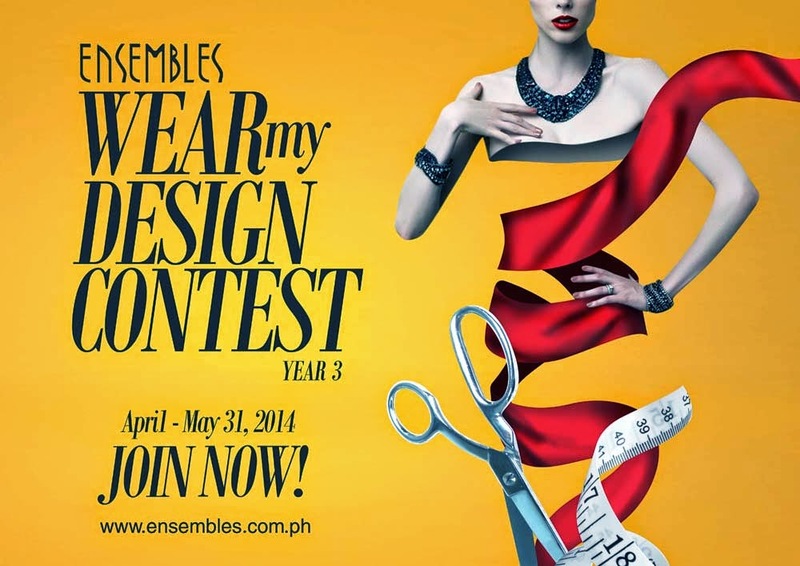 Join Ensembles WEAR MY DESIGN CONTEST Year 3! If you have an eye for fashion, then this is definitely for you! All you have to do is submit a dress prototype of your design together with an application form downloaded from Ensembles Facebook page. Contest starts at April 1 to May 31st, 2014! All submitted entries will be uploaded at Ensembles’ Facebook page for voting. Each winner will receive a cash prize and gift certificates from Ensembles, plus special gift packs from our wonderful partners VMV Hypoallergenics and Piandre Salon. Winning entries will also be featured in the Spring 2015 Collection with the designers’ names credited on the hangtags. Your spring dress design maybe the one unveiled next year! Learn more about ‘Wear My Design’ Competition mechanics and rules at http://www.ensembles.com.ph. Like Ensembles Facebook page (facebook.com/EnsemblesOnline). Follow Ensembles on Twitter and Instagram @EnsemblesOnline. Summer is slowly kicking in! Are you ready? No fuss! Solo's Summer Collection 2014 is up to complete your summer essentials and set your summer vibes high! Solo's Summer Collection 2014 is composed of wide-range swim wear pieces that cater to different types of young. Boasting variety of looks for Him and Her such as tribal prints, floral patterns, retro feels, and solid colors strategically placed on bandeau, bikini tops and high-waisted bottoms creating fun statement, the Summer Collection 2014 is sure to tick off your checklist complete with flattering cover ups and stylish eyewear for ladies and gents to complement the hot season! The hot collection features this year’s Solo Online Model Contest Grand Winners, Renee Soraya Hassani and John Edward Custodio who stood out among almost a hundred hopeful ladies and gents! The pair got to do a photo shoot directed and photographed by hot fashion photog Doc Marlon. Renee, 22 recently finished Interior Design at Philippine School of Interior Design, now part of their family business and still wants to pursue modeling, an unlikely path for her, while John Edward, 21 is set to fulfill his dreams of being an actor by venturing to a strong stepping stone which is modeling. When asked about the experience, both quipped that they learned a lot from Doc Marlon and were very inspired to improve their craft and be the face of Solo to the youth. “I want to contribute among the wide varieties of beauty our world has come to define today,” Renee said. Make sure to brush those summer jitters away and conquer the hot season in tribal or floral prints fromthis year’s one-stop summer shop! Too busy? Shop online, it’s easy and reliable! For more information, please log on to solo.com.ph or like our Facebook page facebook.com/mysoloonline. You can also follow us on Twitter and Instagram @MySoloOnline.